Hamilton Racecourse is situated on the west side of the Henty Highway, north-west of the centre of Hamilton. The first horse races were held at Hamilton in 1854 and in 1859 the present site of the racecourse was reserved temporarily. A further area was reserved in 1861 and the total area reserved permanently in 1874. In 1860 the Hamilton Turf Club was established, then declined and revived in 1867 as the Western Racing Club, later merging with other clubs to form the Hamilton Racing Club. In 1873 the racecourse was in the process of being declared a permanent reserve so it was possible to make improvements such as having a grandstand built. The club laid down a new course and commissioned a grandstand. The grandstand was designed by Robert Cooper Bagot and supervised by architect William Smith. The main structure is post and beam with heavy timber posts and bracing and a timber top plate at the rear. At the front a bluestone ashlar wall supports cast iron columns in four bays with a wrought iron lattice beam above. The rear and side walls are of corrugated iron on timber framing. The plates are supported on timber trusses with a basement level below. 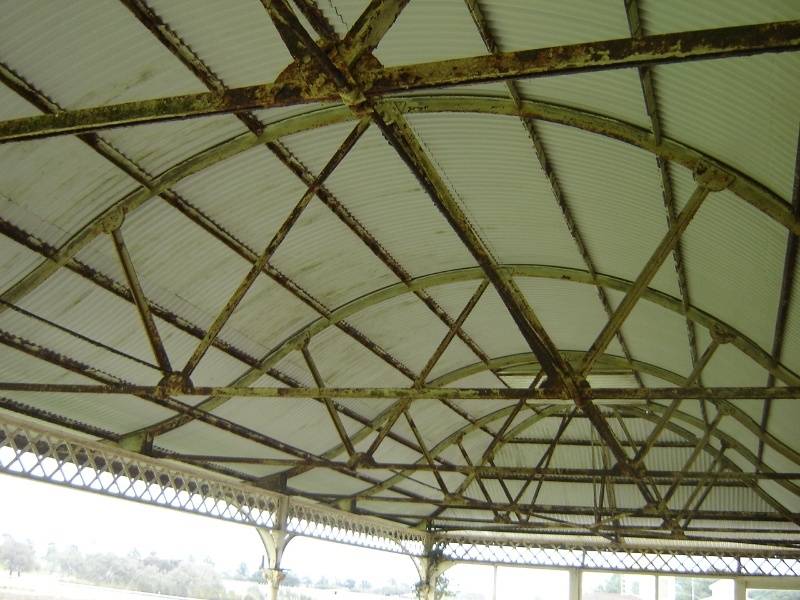 The roof structure consists of web trusses made up from wrought iron angle members joined with rivets at plate gussets. The hipped corrugated iron roof is shaped in a graceful double curve with generous eaves all round. The eaves are further supported by curved iron brackets springing from the posts and columns. Octagonal ventilator turrets in timber with ogee roofs and flagpoles are placed at either end of the ridge. The front of the stand has a balustrade of timber rail and cast iron lace. The seats are timber slats on heavy wrought iron frames (which may be original) bolted to the plates. One of the open sides of the grandstand has been glazed in at a later date. The original stairs have been replaced. The low corrugated iron verandah roof on the rear and sides features a similar double curve to the main roof, and provides an appropriate and pleasing reference to country homesteads. Adjacent to the grandstand is the members' reserve, designed by local architect Frank Punch and opened by the Premier R. J. Hamer on 8 April 1981. Irish born Robert Cooper Bagot (1828?-1881), civil engineer and surveyor, arrived in Melbourne in 1855 and in 1861 redesigned the Melbourne Cricket Ground (MCG). As the first Secretary of the Victoria Racing Club, Bagot redesigned Flemington Racecourse; established the Melbourne Cup as the leading horse race in Australia; and played a major role in making the sport of horse racing accessible to the ordinary person. He also encouraged women to attend the races, in particular by providing facilities such as grandstands. He is included in the Australian Racing Hall of Fame and depicted along with other significant figures in the MCG 150th Anniversary Tapestry. Other racing clubs such as the Ballarat Turf Club in 1866 also engaged Bagot to design grandstands. The architect William Smith, 1838-1909, came to Victoria in 1866 from London and also worked as a civil engineer and surveyor. He settled in Hamilton and was appointed town surveyor in 1870 and town clerk from 1874 until 1887. 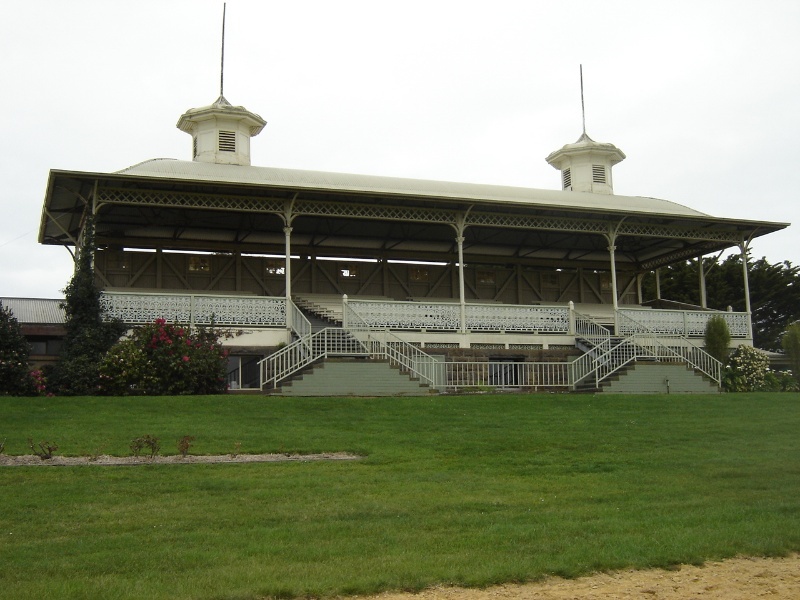 Hamilton Racing Club Grandstand is of architectural and historical significance to the State of Victoria. 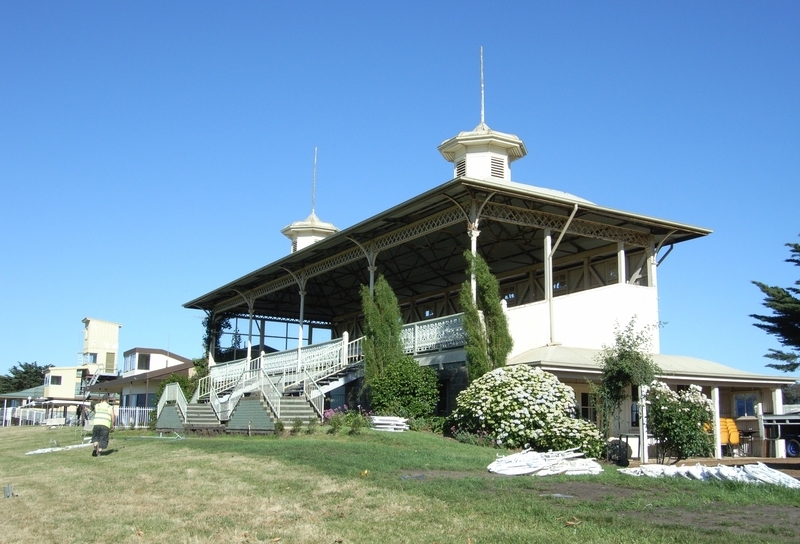 Hamilton Racing Club Grandstand is of architectural significance as one of the earliest surviving grandstands in Victoria. It is significant as a sophisticated example of grandstand design with its turrets giving the structure a distinctively exotic appearance. Hamilton Racing Club Grandstand is of historical significance for its associations with the history of horse racing in Victoria and with Robert Bagot, an important figure in the history of sport. The grandstand is a rare surviving example of an early racetrack structure. It reflects the increasing popularity of the sport and the need for the club to provide comfortable facilities at the racecourse, in particular to accommodate women. 1. All the building marked B1 on Diagram 137 held by the Executive Director. 2. 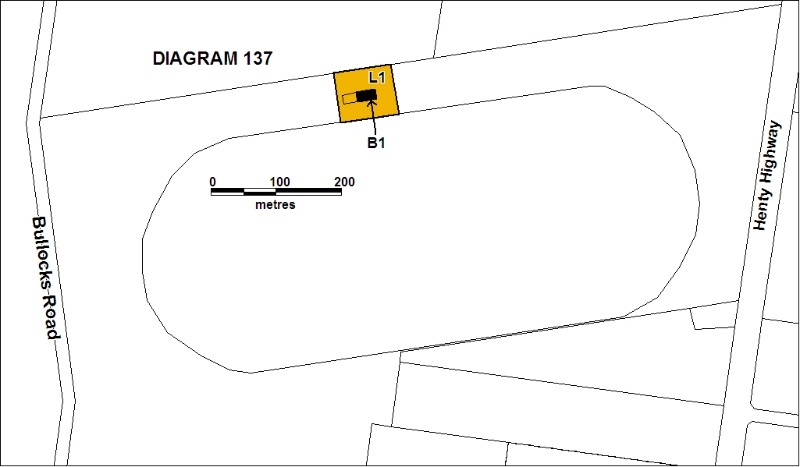 All the land marked L1 on Diagram 137 held by the Executive Director being part of Crown Reserve Rs 02942 permanently reserved for racecourse and recreation purposes. The designer of the grandstand was Robert Cooper Bagot (1828?-1881), a civil engineer, who emigrated to NSW in 1849, arriving in Melbourne in 1855 where he established himself as a civil engineer and surveyor. The architect was William Smith, 1838-1909, came to Victoria in 1866 from London and worked as a civil engineer and surveyor. He settled in Hamilton and was appointed town surveyor in 1870. He was town clerk from 1874 until 1887. In 1861 Bagot redesigned the Melbourne Cricket Ground. The first Secretary of the Victoria Racing Club, Bagot redesigned Flemington racecourse and established the Melbourne Cup as the leading horse race in Australia. Bagot played a leading role in giving colonial racing its egalitarian character and making it the recreation for the masses. He was invited to become Secretary of the newly formed Victoria Racing Club despite not having knowledge of racing. He redesigned Flemington racecourse, draining the marsh and made "The Flat" which was a picnic ground for generations of race-goers, replaced the grass and persuaded the VRC to buy land that he made into "The Hill". He insisted that the Flat should be free and the charge for the Hill should not exceed 1s. A new grandstand was built to encourage ladies to attend race meetings. He established the Melbourne Cup as Australia's premier horse race. What he did at Flemington was copied at racecourses all over Australia. He is a champion in the Australian Racing Museum and Hall of Fame. He is included in the MCG Tapestry, designed by Robert Ingpen and woven by the Victorian Tapestry Workshop, which depicts nearly 200 figures associated with the ground. The members' reserve, designed by local architect Frank Punch comprising bar, and function room and balcony was opened by the Premier R. J. Hamer on 8 April 1981. An administration block was opened on 5 December 1997. The grandstand was built in 1873 to a design by engineer and surveyor Robert Cooper Bagot and supervised by architect William Smith. 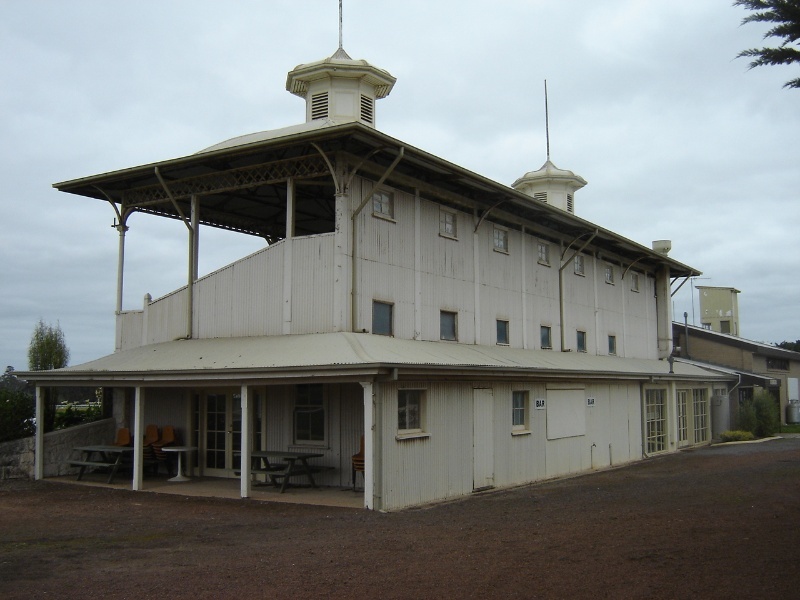 It is significant as one of the earliest surviving grandstands in Victoria. Any works to non-registered buildings and structures within the extent of registration, but not additions. Repairs, replacement or installation of rubbish bins, bicycle racks and other small items and street furniture. Repairs, conservation and maintenance to hard landscape elements, structures, ornaments, roads and paths, drainage and irrigation system. 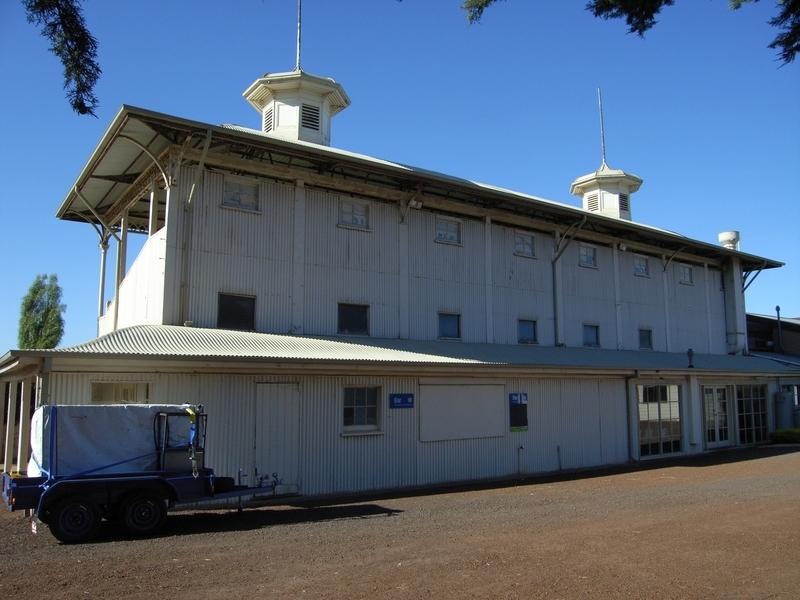 The cultural heritage significance of the Hamilton Racecourse Grandstand is principally due to its architectural and historical significance as an early and intact example of a substantial country racecourse grandstand. Alterations which impact on the significance of this structure are subject to permit applications. Removal of the seats would require a permit. All works to non-registered buildings and structures, including demolition and internal modification, (including to the adjacent members' reserve) within the extent of registration are permit exempt, but any additions would require permits. Permits would be required for any new buildings, structures, landscape works, driveways and paths on the registered land.